Home 1st , 40 Blocked tube, ovarian cysts - pregnant miracle! 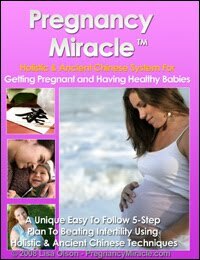 Blocked tube, ovarian cysts - pregnant miracle! I have no words to express my gratitude! I have fought with infertility issues for more than a decade. My Gyn told a year ago that one of my tubes was blocked, and had insisted that IVF was the only option left for me. 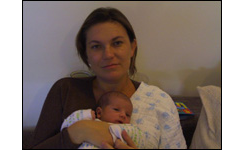 I was desperate and terrified due to my relatively advanced age and the two ovarian cysts that were giving me hell, that I would be childless. My husband and I decided we will keep on fighting as I have read many awful stories about the side effects, the low success rates and pain involved with the IVF procedure so we kept looking for a natural alternative. We almost gave up and then I found your Pregnancy Miracle website and emailed you for guidance BEFORE I bought your program. You were so supportive and kind that I immediately ordered your book and started the program along with my husband who had poor sperm motility (an issue that your program addressed as well). After two months of trying I got pregnant with my first baby boy. With one blocked tube and two ovarian cysts, I think this is nothing short of a miracle!